Dad was confused. He’d been experimenting with Google AdWords and he called me with a question. He wanted to know how to create an ad that would appear on Google … not the top or right section where the paid ads appear, but in the main center portion of the page. Dad was trying to do something that’s not even possible. Most small business owners are equally confused about search engine marketing. A recent survey revealed that the majority of small business owners feel that Internet marketing is very important. Yet, 59 percent of small businesses with web sites don’t use paid search marketing … and of those, 90 percent have never even attempted it! So if you want to know more about search engine marketing, but you don’t know a PPC from a SERP, you’ve come to the right place. Here’s my Internet Marketing 101 Primer. When you type in a search phrase in the search box, Google serves up several pages of results. This is called the Search Engine Results Page, or SERP. (There’s one acronym down.) The search results come in two varieties, paid and natural, and they appear on different parts on the page. These are called Pay-Per-Click (PPC) ads because the advertisers pay Google money each time their ad is clicked on. 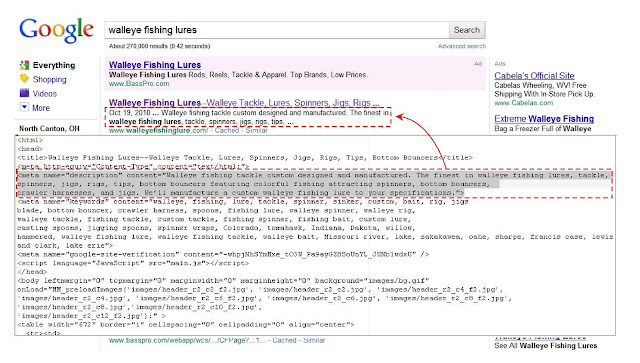 The advertiser who is willing to pay the most for a particular search term (such as “fishing lures” in my example) is the one who will appear at the top. The search results that appear on the main body of the page are not ads. These are called the “natural” or “organic” results. As I said, these are not ads. You cannot pay Google to appear in the natural search results. Google’s complex (and highly secret) mathematical algorithms determine who gets well-ranked and who doesn’t. To achieve a top ranking (especially in a highly competitive field), you must either be very smart, or you must hire someone who is very smart to do it for you. These very smart people are known as Search Engine Optimization (SEO) specialists. Part art and part science, Search Engine Optimization is the process of making a website’s code, structure and content as “search engine friendly” as possible in order to get the search engines to rank it as high as possible on the Search Engine Results Page (SERP). When I ran my web business, I helped clients get good search engine ranking by sub-contracting the services of these very smart SEO people. But in order to explain the benefits and pitfalls, I also had to be able to talk about it in non-technical terms. Here’s as non-technical as it gets: search engine marketing is only successful if you get a return on your investment. Some companies choose to exclusively use Google’s Pay-Per Click to sell their products online. Others use search engine optimization. And still others use both. What you choose to do depends on many factors, and each one has its advantages and disadvantages. So it’s not a question of which is best, but which is best for you. In my next post, I’ll outline the pros and cons of each to help point you the right direction. Wow this is simple but very interesting post! Resources like the one you mentioned here will be very useful to me… I feel strongly about it and love learning more on this topic.